Another one of those things.. you either LOVE them, or you are disgusted by them. My belly loves them, my wallet... not so much. Luckily for us, our friend (name undisclosed for his protection), has connections with a local restaurant and he orders them by the hundreds. 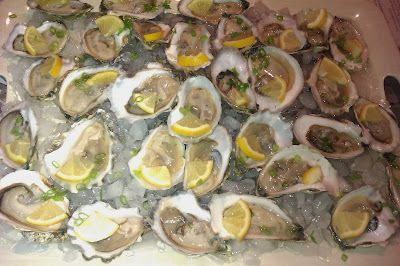 We make an oyster party out of it, the girls cook, and the guys shuck. It's a win-win situation, we get our oyster fix without breaking the bank. I vaguely remember Moonstones in Chelmsford having a special.. but I cannot find it on their website. 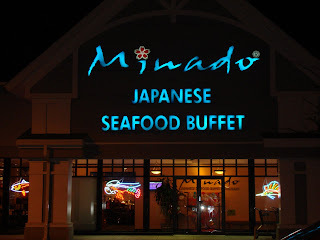 Minado- VERY CLEAN BUFFET establishment, variety of sushi, Japanese entrees and appetizers, Shellfish, and green tea ice cream. If you are going to eat the Oysters, the $31.95 is well worth the price.